From poultry to fresh produce, fighting Salmonella contamination is requiring more federal measures and innovative technology for rapid detection. By 2020, the CDC has targeted a reduction in Salmonella cases at 11.4 per 100,000 people (last year’s rate was 15.4 per 100,000). Considering that the number of cases has not declined in the past 10+ years, regulators and industry will need to work together more closely on utilizing methods and technologies that provide effective pathogen detection. It is a well-known fact within the food safety industry that Salmonella is the second most common foodborne illness in the United States, and the bacteria comes in first place in the category of foodborne illnesses that lead to hospitalization or death. Unfortunately, there has been no change in the number of confirmed infections between the 2006-2008 period and last year, according to the CDC’s Foodborne Diseases Active Surveillance Network (FoodNet) 2014 Food Safety Progress Report. 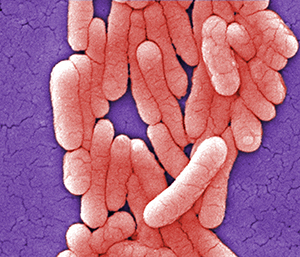 Each year Salmonella makes its way into the food supply through a variety of sources, sickening more than 1 million people in the United States and costing the country nearly $3.7 billion, according to the USDA. Although it is most commonly found in contaminated animal-derived products, the level of serious outbreaks over the past few years is cause for concern, as the bacteria have appeared in processed foods such as peanut butter and fresh produce, including cucumbers, cantaloupes, alfalfa sprouts and jalapeno peppers. USDA’s Food Safety and Inspection Service (FSIS) proposed federal measures in January to lower the rate of Salmonella in poultry, including a pathogen reduction performance standard for chicken parts, and ground chicken and turkey. FSIS began the sample project for raw chicken parts in March (only for firms that produce more than 1,000 lbs of chicken parts daily) and a verification testing program for poultry carcass inspection, using a moving window of sampling results, in May (view the full Federal Register notice). Providing rapid pathogen detection for Salmonella in less than 24 hours has been a priority for industry. Companies want to both prevent contaminated foods from entering the market as well as ensure that products can be quickly tested so that they are not sitting in a warehouse for days awaiting results. With this focus comes a need to provide testing in the processing environment. From enzyme immunoassays (EIA) and enzyme-linked immunosorbent assays (ELISA) to PCR assays, there are a large variety of established testing and identification technologies on the market. However, in taking a different approach to lowering the risk of Salmonella from entering the market, companies can employ limits testing as an additional tool to verify process control within a production shift. Salmonella limits testing is a semi-quantitative method that provides a “positive” or “no-go” result based on initial contamination levels of a sample, and does so within a day. Limits testing provides a semi-quantitative approach to lowering Salmonella levels. As a case example of limits testing being used in the field, Cargill asked Roka Bioscience to develop a limits-based approach for testing its ground turkey for Salmonella. Roka was required to provide Salmonella detection levels at about 1 CFU/g in a 375 g sample size of ground meat in less than eight hours (total time to result). Roka successfully developed the limits application, and Cargill now uses the tool to make product disposition decisions prior to shipping its ground turkey. Roka is also looking at other areas in which limits testing can be used, from the pre-harvest to live production environments. Calling on industry to push harder to innovate in foodborne pathogen detection, FDA announced its 2014 Food Safety Challenge last fall. The agency is offering a hefty prize—$500,00—to the team that can develop a technique or technology that creates “significant improvements” in the speed at which FDA can detect Salmonella in fresh, minimally processed produce. The finalists, announced last month, have received $20,000 to further develop their concepts and are being mentored by FDA in food safety and pathogen testing. A handheld magnetoelastic biosensor and surface-scanning detector that can be passed over food to detect surface contamination. The portable device can be used both in a process facility as well as remote locations in which produce is being harvested and delivers results in minutes, according to the team’s leader, Bryan Chin, director of the Auburn University Detection and Food Safety Center. Method for concentrating salmonella to detectable levels using automated microfiltration, developed by Purdue University. Portable system for multiplexed detection of foodborne pathogens in microfluidic biochips through isothermal DNA amplification and electrical detection, developed by University of Illinois and Purdue University. On July 7, FDA is holding a Demo Day at the Center for Food Safety and Applied Nutrition in Maryland where the finalists will present their refined concepts to judges from the FDA, USDA, and CDC, and a live audience. The winner of the Food Safety Challenge will also be announced sometime next month.